Weather looks good but the top of the mountain is always cooler so come prepared. Start at Constantia Nek and run along the contour path to skeleton gorge. Once we have gone up Skeleton, there is a choice: We can turn left and go directly to Nursery, or we can visit the beach and run alongside Healy Hutchinson and then turn back to Nursery (extra 2kms). For those that don't want to go down Nursery, Gaeleen will be taking Smuts track and running down past the overseer's cottage and the concrete road. Single track, jeep track with a climb and optional steep descent. Distances vary between 10 km and 14km depending on route chosen. Tomorrows run is ON with a chilly but clear start. RV in the Vida e Caffe parking area 06:50 ready to start at 07:00. Relaxed group update: there will be no relaxed group. Good luck to all taking part in the Peace Trail, Marathon and any other events this weekend - have fun! This week we return to the Republic of Hout Bay for a route with a mixture of trail and road. Meet at the parking by Vida e Caffe at the bottom of Chappies. We warm up with a run up the road to the start of the trail at East Fort. The lungs get working heading up to the contour path and then we hang a right towards Blackburn Ravine. Following the single track we are treated to magnificent views (weather permitting) across the bay. At approximately 6km we start descending and at the trail intersection hang right to head down to Chapmans Peak drive, popping out by the "ticket checker". From here we have a leg stretching run on the tar back to our cars. Please remember this a pack run, and with the recent reported incidents its even more important that we look out for each other. RV in the parking area 06:50 ready to start at 07:00. A whistle, water, a warm & waterproof/windproof top, space blanket and ICE tag or card. 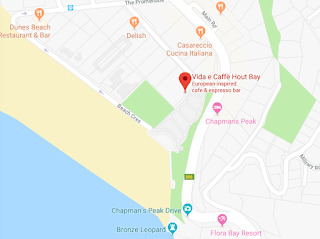 I'm happy to confirm that we'll be meeting at the Mouille Point lighthouse tomorrow for the route briefing and sign-in at about 6:50, ready to run at 7am. Sorry - forgot to say that start time is 7am so check-in is at 6:50am. Spring has sprung and the world is puddle-wonderful* and it's time for our own version of the Peace Trail. We'll differ slightly from the official run in that we'll begin at the traditional Trailer's start venue: the Mouille Point Lighthouse. From here we'll begin the climb up Signal Hill vía Glengarriff Road. 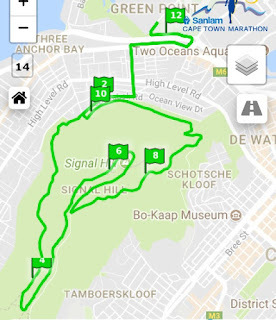 The rest of the Medium group's run will follow the Peace Trail route along single track with amazing views of our darling Table and the Oceans all round. The distance will be about 12km. The Faster group will ascend a section of Lion's Head. Bring Water, whistle & a warm, wind proof or waterproof top. Have your ICE info and space blanket in your pack too please! 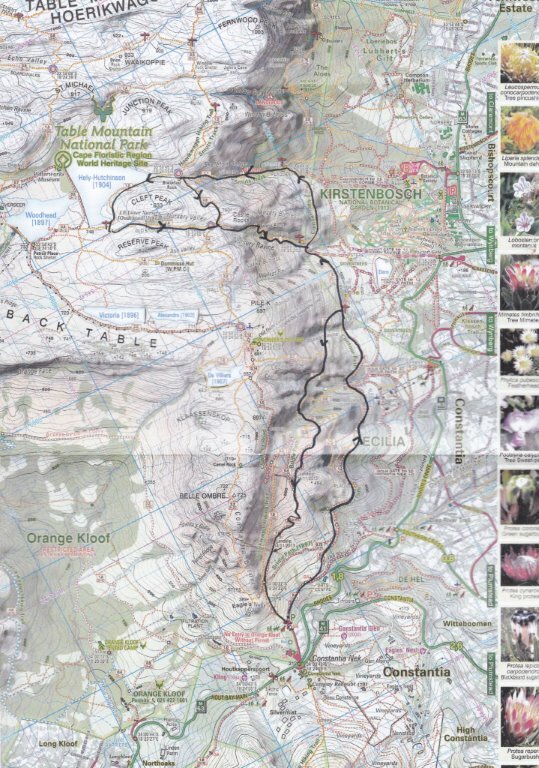 Meet in the Newlands Forest carpark at 7. There should be 3 groups, fast-ish, medium and relaxed. The fast-ish and medium groups will do the whole route, and the pace of the group will be the pace of the slowest runner. There will be frequent regroups to keep the group together. The weather looks peachy, no cloud, hardly any wind and a high of 16. Perfect. 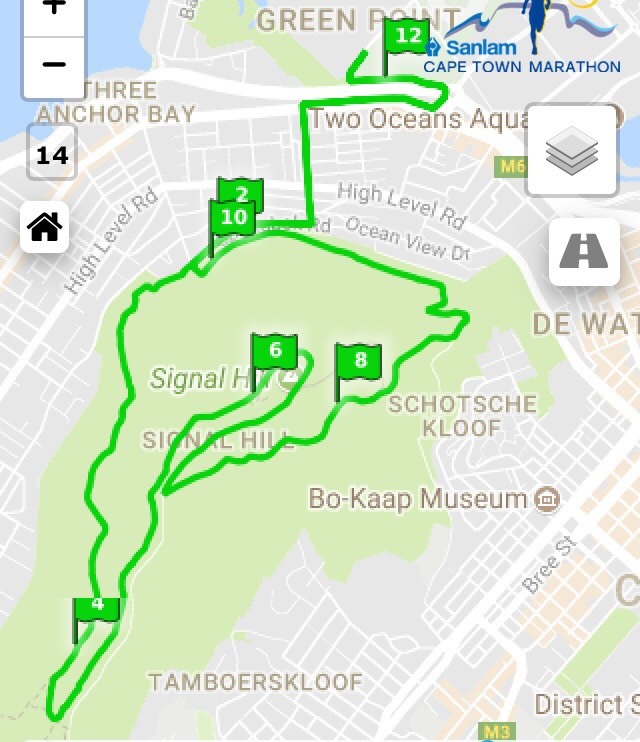 Saturday we plan to meet at Newlands forest to start running at 7. We are going to UP to the contour path, then UP Newlands ravine to the saddle, then down and around the front of Devil's Peak probably via Oppelskop and the blockhouse back to the cars.